Track 01 : A song written for the "Psycho Circus" album which not be used. Track 02 : A discarded Paul Stanley song which didn't blend with the overall tone of the "Psycho Circus" album. Bruce Kulick played bass on the demo. 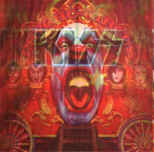 Track 03 - 08 : Paul Stanley related song titles mentioned in interviews during the "Psycho Circus" recording sessions.